an applied electric field. A semiconductor is like an insulator except that the energy required to free some electrons is not quite so great. More important, doping can supply electrons or positive charge carriers that are very loosely held within the material and thus are ease to get moving. Moreover, by controlling the doping of a semiconductor, we can . control the density of charge carriers that can participate in a current, and thereby can control some of its electrical properties. Most semiconducting devices, such as transistors and junction diodes, are fabricated by the selective doping of different regions of the silicon with impurity atoms of different kinds.Let us now look again at Eq. 27-20 for the resistivity of a conductor:where n is the number of charge carriers per unit volume and T is the mean time between collisions of the charge carriers. 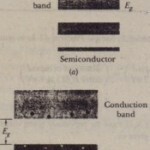 (We derived this equation for conductors, but it also applies to semiconductors.) Let us consider how the variables and T change as the temperature is increased. In a conductor, 11 is large but very nearly constant with any change in temperature. The increase of resistivity with temperature for metals is due to an increase in the collision rate of the charge carriers, which shows up in Eq. 27-24as a decrease in T, the mean time between collisions. In a semiconductor. /I is small but increases very rapidly with temperature as the increased thermal agitation makes more charge carriers available. This causes decrease of resistivity with increasing temperature, as indicated by the negative temperature coefficient of resistivity for silicon in Table 27-2. The same increase in collision rate that we noted for metals also occurs for semiconductors, but its effect is swamped by the rapid increase in the number of charge carriers.